Tesla Engineering is a leading company in the design and manufacture of gradient coils, MRI and bending magnets for radiation therapy. Tesla is an example of a customer that is part of a rapidly growing OEM business that requires the engineering skills of companies like ServerCool. These skills are essential to design and manufacture made-to-order products that interact with a customer’s own systems where the prime objective is the removal of heat, and the control of environments and system conditions. Tesla’s gradient coils can be found in many of the world’s MRI scanners. A gradient coil is a tube-like construction of copper, glass and resin and measures about 1.5 meters by 1 meter and weighs just over a ton. The gradient coil is where a patient lies during a body scan. All over the world, MRI scanners are used daily for long periods of time to detect a variety of illnesses. This essential and highly-sophisticated piece of equipment functions by combining magnet technology and customized cooling. Heat generated from the coil needs to be dissipated, not only to prevent the entire unit from overheating, but for the protection of the patient inside. A constant gradient coil temperature is essential for quality, sharp images. 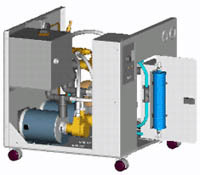 Tesla approached ServerCool to design a heat exchanger to provide water cooling in a closed loop system. Having previously completed similar projects for other companies in the same field was a distinct advantage. However, the design Tesla required was different than past projects. Size and weight were important factors along with the use of de-ionized water. In addition, Tesla laid down stringent design criteria and performance levels. Medical equipment must work to optimum performance levels. Quality of build is paramount. Tesla guarantees all its products and manufactures to high specifications, ensuring at least a 10-year lifespan. SeverCool was required to meet these same performance levels. ServerCool’s team applied its skills to design a system capable of delivering closely-controlled cooled water to the gradient coil. The system is designed to automatically circulate water as soon as the scanner is activated. Heat builds up as a result of frequent use; therefore, the temperature needs to be strictly controlled. This design can control the water temperature at plus or minus 1° centigrade. As an OEM, SeverCool has a distinct advantage over its competitors. Companies manufacturing “off-the-shelf” products cannot compete as they lack ServerCool’s flexibility and skill base. Unusual cooling applications require special design solutions. Different technologies must be combined to create a piece of equipment that cannot be bought ready-made. Gradient coil systems are one of the fastest developing areas in MRI technology. In recognition of this, Tesla continually strives to maintain its competitive edge. Faster images and finer resolutions require more powerful gradient coils, which are dependent on ServerCool’s ability to provide and enhance cooling quality.